September is almost gone and we’re getting in gear to enter the month of October shenanigans. Whether you want to invoke your inner Fashionista or party it up with big names this weekend has plenty to do. Some of the big names in town include Alesso, AKON, Calvin Harris, and Helena to name just a few of superstars heading to our city. Calling all Fashionistas! Identity Media and the Hoxton Urban Beach House bring Fashion + Beauty Fix. Ladies shops some of the hottest trends and accessories while enjoying Little Black Dress Cocktails throughout the night. 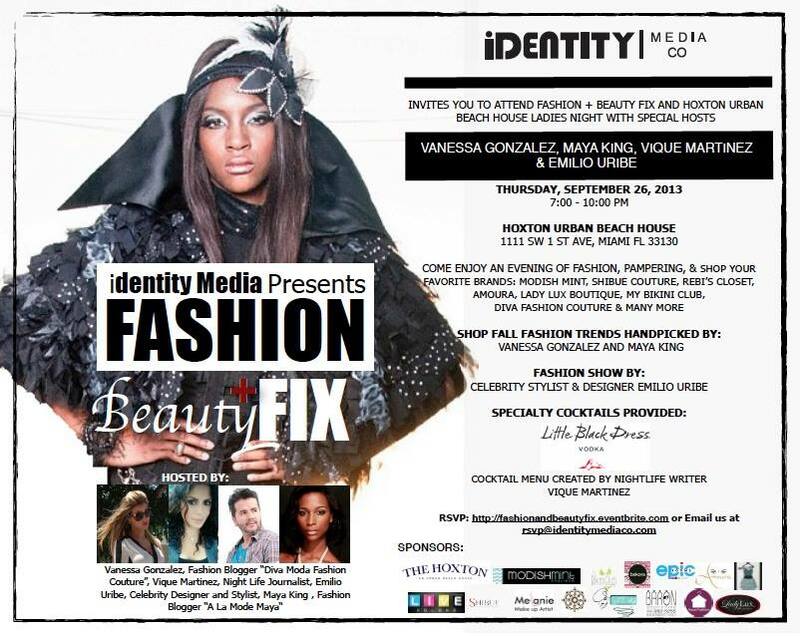 The event will be hosted by Yours Truly and enjoy a fashion show by celebrity stylist and designer Emilio Uribe. Doors open at 7pm. To get tickets Click here. The weekend is here and time to celebrate! Aquabooty Miami is celebrating 14 years of house music history in Miami at the Electric Pickle. Enjoy sounds by Osunlade, Move D, DHM and many more special guests. Doors open at 10pm. It’s been 14 long years with glorious, deep, dirty, deviant and sweaty, diskoid dancing and everyone is invited to be there for the big night! Get your tickets in advance to avoid any missions if they hit capacity. Also at Story this weekend get in the mix with Victor Calderone on Saturday presented by LINK and Miami Rebels. Doors open at 11pm, you must be 21+ to get in. Also at Bamboo this weekend don’t miss a night with Project46 on Saturday. Taking the electronic world head on and tackling dance floors from Melbourne to Miami this musical empress and special guest Helena will be of sheer importance to speakers at Others Play House we Play Mansion. Helena has become of the leading female DJs/Producer/singers of the electronic music scene and when she takes over the decks, she keeps you on your toes, dancing like no one is watching until the sun comes up to the best of progressive, electro, and house beats. Don’t miss this weekend as she drops club favorites such as “Detox”, “Set Me Free” and many more. It all starts at 11pm. Further down the street get ready for a night with international star Calvin Harris. He’s rocking the decks at LIV alongside resident Mednas. It’s going to be a crazy night of some of the best progressive and electro house beats with club anthems such as “Sweet Nothing” “I Need Your Love” and “Bounce”. Also at LIV this week check out Danni C and Dyro (both are newcomers on Hardwell’s label) on Thursday and special guest Tone Loc on Friday with Mr. Mauricio on the decks. Doors open at 11pm, dress to impress and early arrival is suggested. Bottle specials starting at $195 or $420 bottle special includes 2 premium bottles and 1 champagne. What better way to end the weekend than at Delano’s tropical oasis, Delano Beach Club for and epic evening filled with cold drinks, great music and a beautiful sunset. Sunday party it up poolside from 6 p.m. to 12 a.m. as the sun sets over Miami’s skyline and Link & Miami Rebels take charge. Delano Beach Club will be transformed into a Hawaiian Luau while an amazing lineup of DJs take to the decks. The founder of acclaimed house music label, Hot Creations Lee Foss, UK duo Waifs & Strays along with the crowd pleasing Link & Miami Rebel residents, Ms. Mada, Thunderpony and Hardline will each grace South Beach with a cultured selection of electronica philandering through the vibrant hues of house and techno till the clock strikes twelve. It all starts at 6pm. For tickets Click Here or go to Wantickets.com For cabana/daybed reservations please call 305-924-4071 or email DBCVIP@LIGHTMIA.COM. Jump start your week with Miami’s elite socialites. Mokai proudly brings back the beloved ‘GLOW ME’ party for one night as Mokai Mondays turns down the lights and turns up the glow at Mokai. Text the word “MOKAI” to the number 38714 for FREE Entry! This is one party you don’t want to miss. Doors open at 11pm, dress to impress and you must be 21+ to get in.